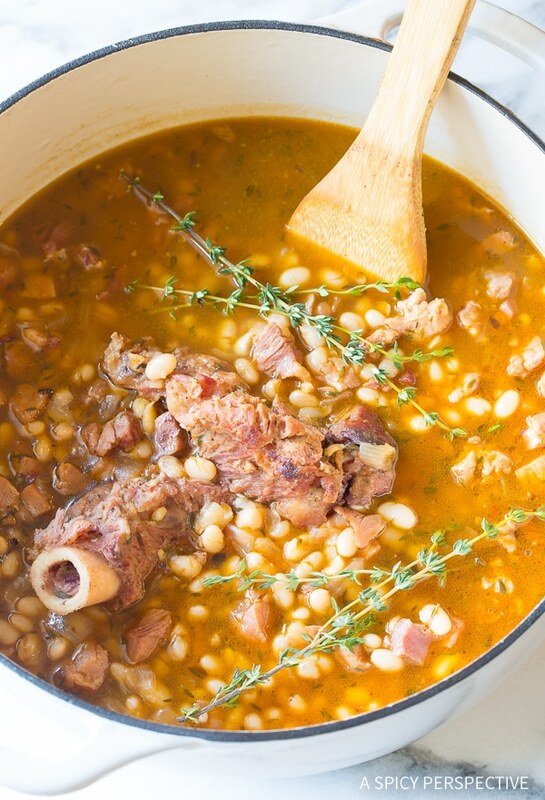 Nana’s Epic Navy Bean Ham Bone Soup Recipe: A simple, yet utterly tempting, ham and bean soup recipe is a great way to use your leftover holiday ham bone. Chances are, after yesterday’s Easter dinner (or any holiday feast) you have a nearly-naked ham bone in your refrigerator at this very moment. Maybe you even finished off your ham to the point of placing the ham bone in the freezer for future use. Either way, today I want to show you exactly how to use your leftover ham bone, to make the most of every last bite of flavor your baked ham can offer! Navy bean soup is the food of my childhood. It’s rich, filling, comforting, and can feed a large crowd on a small budget. Growing up with five kids in our family, and a string of tag-along neighborhood friends, my mom made a lot of meals that could either be stretched to feed extra guests, or could be eaten as leftovers. 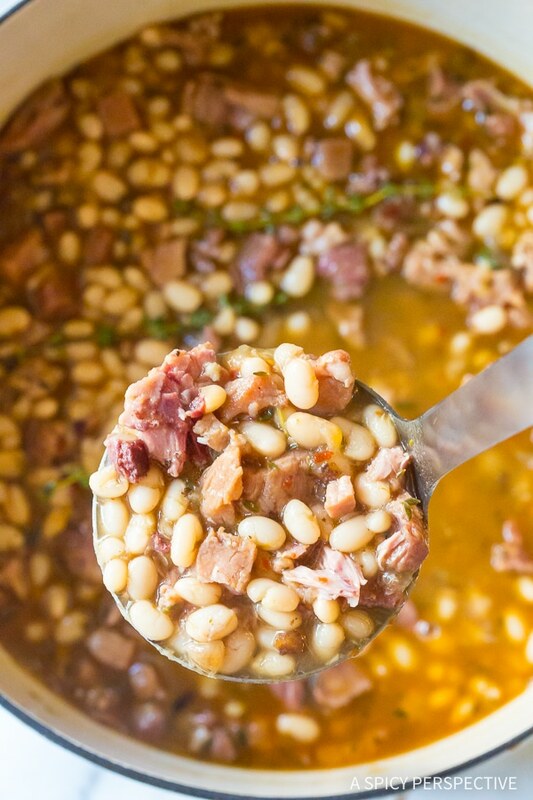 One of my favorite childhood meals was Nana’s Epic Navy Bean Ham Bone Soup, i.e. 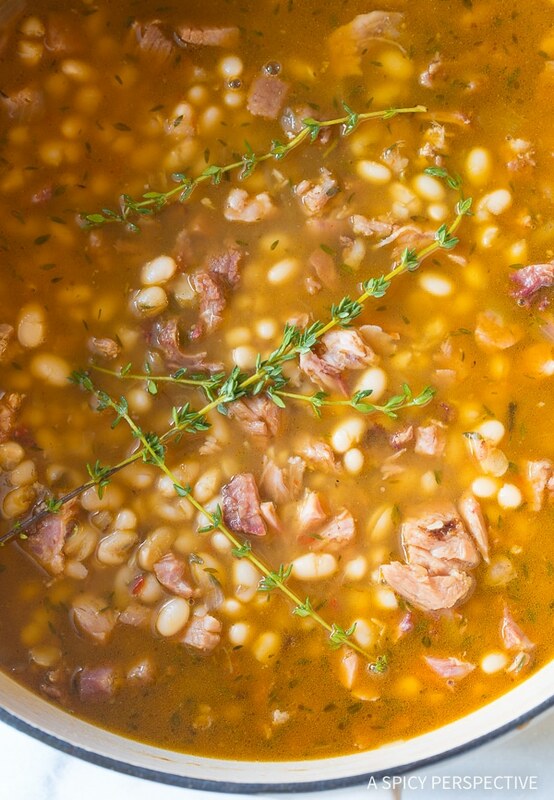 navy bean soup simmered with a leftover ham bone. My mom (now known as Nana) had a special gift for using her resources wisely. Nothing went to waste, ever. All leftovers were either eaten or repurposed, even bones. Nana’s Epic Navy Bean Ham Bone Soup was a meal we ate somewhat regularly, every time a ham graced our table. Nowadays it seems like we only bake a ham a couple of times a year. Usually around the holidays. Yet as a child, I remember having ham at least once a month. Maybe because it is a food that is so easily stretched and repurposed? 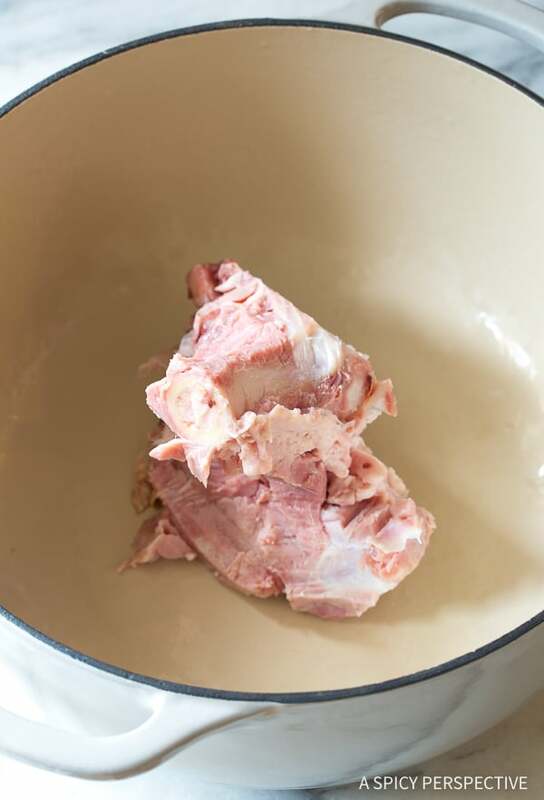 But I digress… Adding a ham bone to soup is a marvelous way to create rich flavor, finish off the last scraps of ham left on the bone, and eliminate the need to buy soup stock. A ham bone boiled in water develops a lovely soup base on its own! 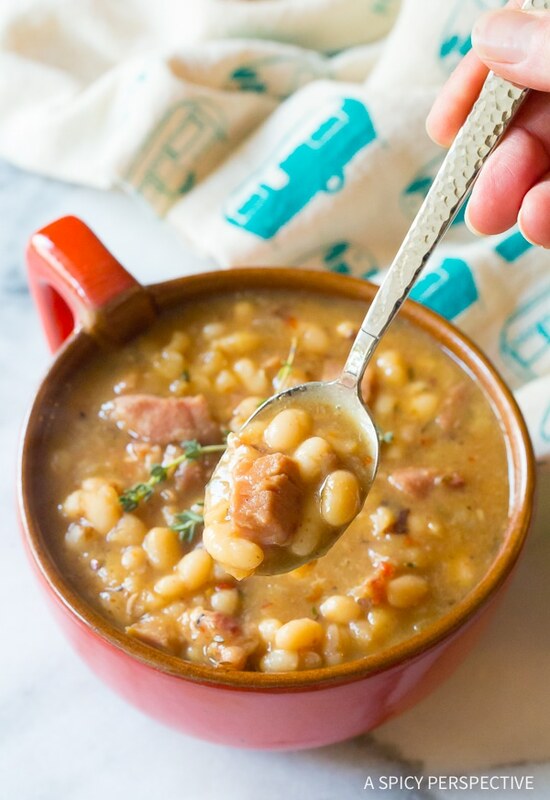 Although Nana’s Epic Navy Bean Ham Bone Soup recipe, varied from time to time, depending on what veggies and spices she found in the kitchen, I’m sharing the most simplified version with you today. 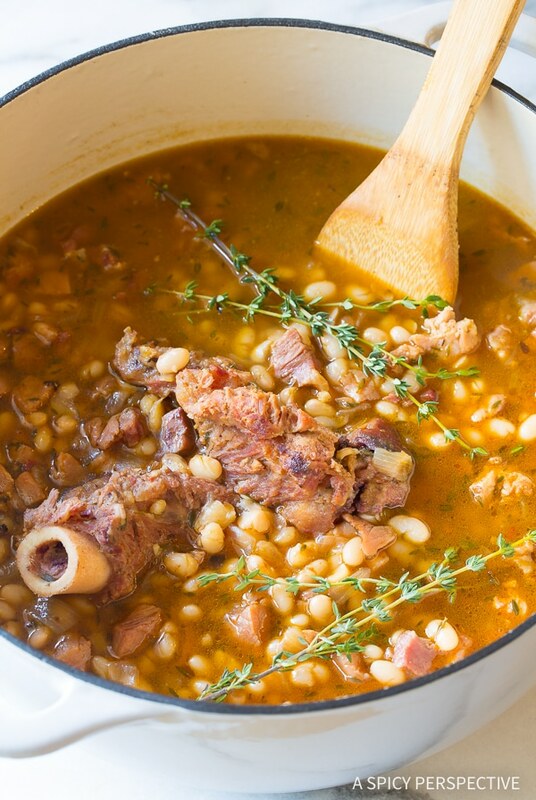 With just a handful of ingredients, including a ham bone and an inexpensive bag of dried navy beans, you can make a rustic hearty deeply satisfying meal your whole family will love. PS – If you didn’t have ham for your holiday dinner, you can buy a ham bone from the butcher for next to nothing. Start by soaking dried beans in water overnight to prep them for cooking. This does take thought to prepare ahead, but it also saves money (on canned beans) reduces sodium and gives the beans a better texture. Quick Tip: If you don’t have time to soak your beans overnight, and you own an electric pressure cooker like an Instant Pot, you can pressure cook the beans instead of soaking them to speed things up. Next sauté the ham bone, onions, and garlic in a little oil. This browns the leftover ham and softens and sweetens the aromatics. Then add in the soaked beans, herbs, spices, and water. Simmer the soup for at least an hour to soften the beans and draw the flavor out of the ham bone. Do not add any salt until the soup is fully cooked. 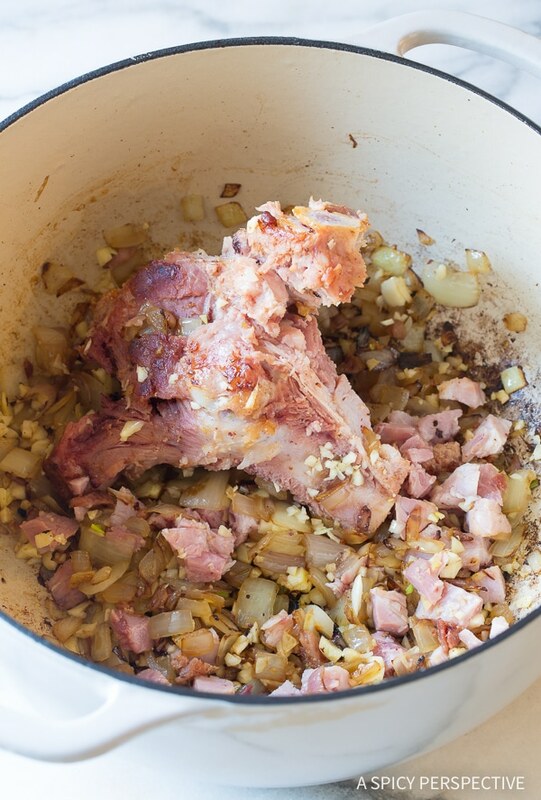 Hambones have a lot of salt in them, and it’s easy to overdo it if you salt the soup too early. Taste and adjust accordingly. You can add any additional vegetable, herbs, or spices you like. Or add extra ham scraps you might want to use up. 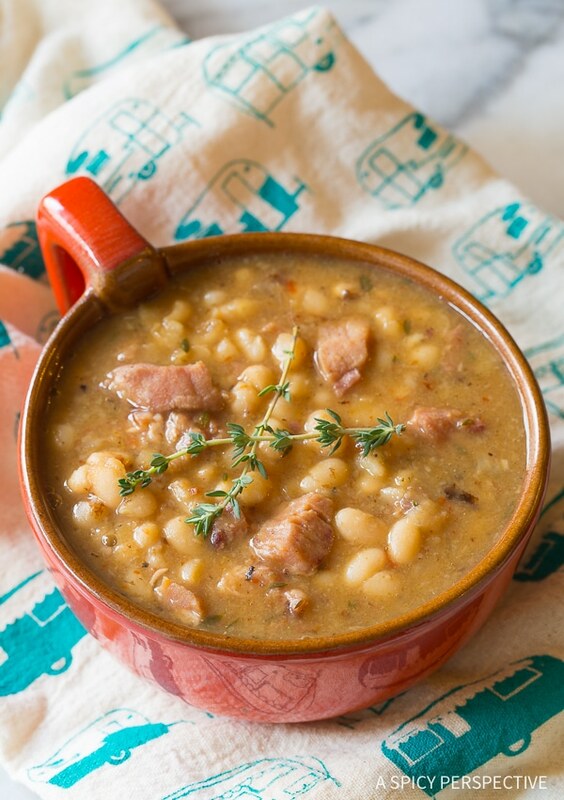 You can freeze Nana’s Epic Navy Bean Ham Bone Soup for later quickie meals. Even consider pureeing it into incredible bean dip to eat with tortilla chips. Next time you buy a ham, make sure to grab a bag of dried beans as well. You won’t be sorry! See The Recipe Card & Video Below For How To Make Ham and Bean Soup. Enjoy! 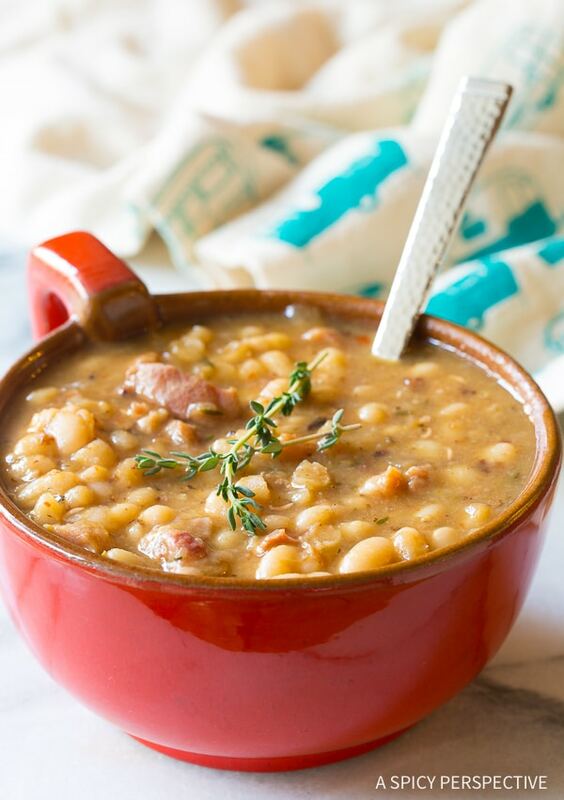 Nana's Epic Navy Bean Ham Bone Soup Recipe - A simple yet utterly addictive ham and bean soup recipe is a great way to use your leftover holiday ham bone. The Night Before: Place the dried beans in a large bowl and cover with three inches of water. Soak the dried beans overnight (up to 24 hours) to soften. Drain when ready to use. Place a large 6 quart pot over medium heat. Add the oil, ham bone, onions, and garlic. Sauté for 3-5 minutes to soften the onions. Bring the soup to a boil. Lower the heat and simmer for 60-90 minutes, covered, until the beans are very soft. Uncover and stir occasionally, then place the lid back on top. Use a fork to pull any remaining ham off the bone and stir it into the soup. Discard the bone. Add 1-2 cups additional water if the soup is too thick. Taste, then salt and pepper as needed. Sometimes Nana (and I) add 2-3 chopped carrots, and 2-3 chopped celery stalks to the soup for additional veggie goodness. They are not necessary, but do add a bit of extra color! If using, add the carrots and celery when you add the onions. Made this today,doubled the recipe but cut the water to 6 cups per pound of beans for a total of 12 cups. That gave the soup the thicker consistency I was looking for. Great recipe. I used to love ham and beans when I was younger. 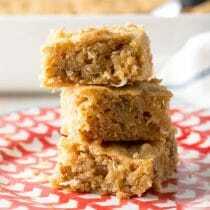 I got very tired of eating them but, this recipe has brought it back to life and my husband and I absolutely love it! The thyme compliments the ham wonderfully. Thank you so much for posting this. It has put ham and beans back on our menu! Great flavor! !…but how would I thicken this soup? Also, I may need to mellow the spicyness now that it is made. Any tips? Thanks! 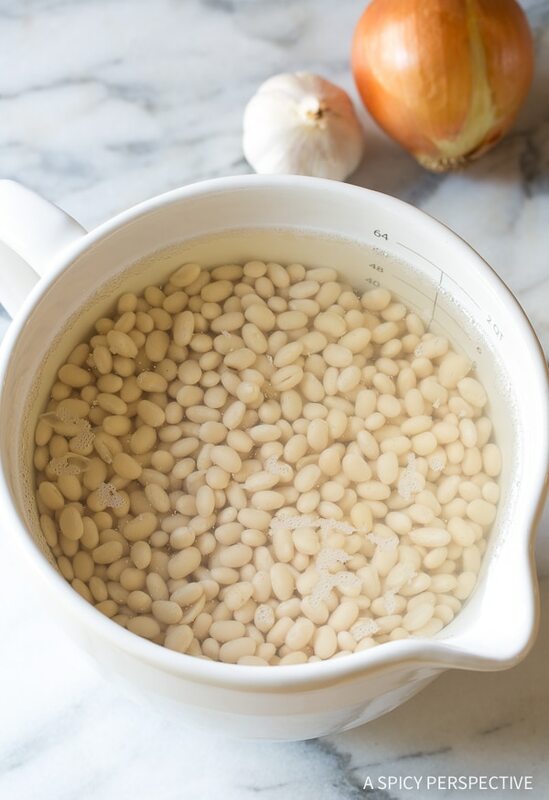 If the beans have cooked long enough, their starches should thicken the soup. You can always omit the crushed red pepper to remove the spicy heat. So very glad you liked it! This is the second time I’m making this! And definitely not the last! Big hit in my house. Yummy, yum, yum! Thanks so much to the author of this blog and owner of this amazing Soup! Perfect for a snowy cold day! 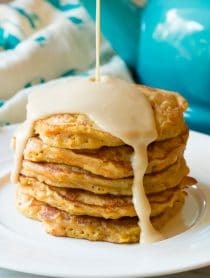 Easy to prepare recipe that the family loved, thank you! 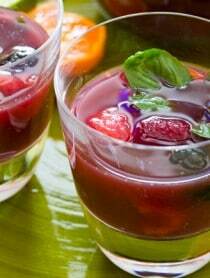 Will be saving this recipe to make again. I used heirloom beans from bobs red mill. Soup tastes fantastic. I also made the soup for my dad! Easy goodness! Hello. This soup looks great. I want to make it tomorrow for my dad. He will absolutely love this. but I need to be out until about a half hour before dinner. Can this soup be made in a crock pot instead? Yum! I had a giant ham given to me as a Christmas gift… Way too much ham for my 3 person family. We’ve been eating ham for days! I made this recipe tonight using the bone and some of the leftover ham (soaked beans since last night). Delicious! My husband said I outdid myself. Which is funny because this recipe could not be any easier! My husband and I love baked ham so I always have ham bones in my freezer. i usually make split pea soup but I wanted to try navy bean so I tried your recipe. I LOVED it!! It was easy and I had all the ingredients in my pantry. I’ll be checking out your other recipes. Thanks and Happy New Year!! But it doesn’t say what the ingredients are. I do not have time to soak my beans. Can I buy the buy the big jar of navy beans? If you need to go with canned beans, 4 – 15 ounces cans equals 1 pound dried beans. Rinse them well before adding to the soup. The soup turned out delicious, much to my surprise! I did add a tomato sliced and cubed. Also, I put a half stick of Kerigold butter and about 1 1/2 tablespoons if ‘It Is Better than Boullion’. I may have used a little more Thyme than a tablespoon. I would have preferred it a little thicker, but it is scrumptious! Thank you! Nanas epic navy bean soup with ham hocks. Bad, bad experience. I am totally lost now. Im a husband/father and l do all the cooking in my familly. I want navy bean soup so last night l go get all the ingredience at Big Y. I soak my beans last night to this morning. That would be about 14 hours. I follow Nanas reciepy to a T. 7 hours and the navy beans are almost as hard as when l started. So, l go back to the store and buy all the ingredience again. But this time l have no time to soak over night. Now l do the next best thing. Rince, bring to boil for 5 minites remove from heat, rest 1 hour then rince again and start over again. Well ,4 hours later and beans are hard again. Not as hard as before but hard. Whats wrong. What happened.? Was it the beans or something l did? Help!was to make for company tonight now what? This has happened to me! Upon research it was my hard water that destroyed the beans leaving them hard and inedible. Hope that helps! I had the same problem with my beans; however, I added 3 tsps. baking soda over two hour period of simmering and finally, soft, edible beans. I loved this recipe. I made Nana’s Epic bean soup on Saturday and truly, you need to add one more word to the description. AWESOME EPIC BEAN SOUP! I did use a ham hock and the cut up ham steak but cut back on the spices a bit as I was bringing some to an elderly friend Belive me, a half tsp. of red pepper flakes was perfect for my taste. I did add one small bay leaf and only a 1/4 tsp of the cumin. I did add the veggies and threw in a can of petite diced tomatoes with liquid ( I used chicken stock and water to make up the 10 cups). My house smelled amazing during the process of cooking. 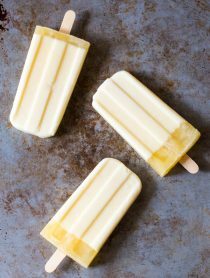 I have some left over which I froze. I was a rainy Saturday and cold so this soup was perfect for warming your insides! OH! I made home made cheddar corn bread to go along …. for a Yankee that grew up in Brooklyn NY I have adapted well here in the South. Thanks for a great recipe!! 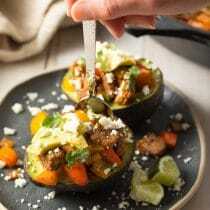 I love the spices in this recipe-very tasty! 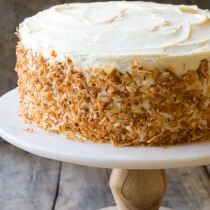 Love the recipe Sommer , especially the addition of the celery and carrots. Could you use a ham hock instead of the ham bone? Thanks for the fast reply. 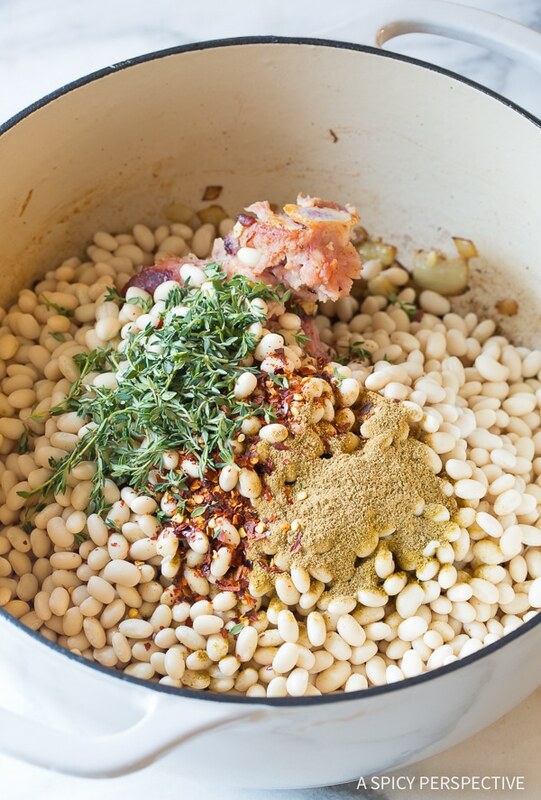 I got my beans soaking right now for tomorrow and can not wait to make this! I did buy an ham steak to cut up but will use the ham hock too. I will surely let you know how it turned out! Blessings and enjoy your weekend. This was amazing!!! The cumin and crushed pepper gives it just the right kick! I come from the same background. A whole lot of leftover/repurposing. From chicken carcasses to short ribs… some fond memories from very frugal sources!!! This was good! I soaked the beans overnight then made it in the crockpot. My family all had 2nd servings. I reduced water to 8 cups and added 2.5 tbsp of chicken bouillon. I also sauteed carrots and added them at the end because sauce was too thin. I will be making again. Thanks for sharing! 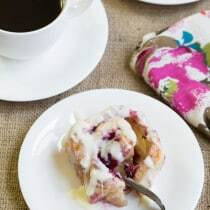 That looks Delicious; especially on this chilly morning. What a wonderful childhood memory to warm the soul.